Looking to give your calves an added boost? Dynavyte offers a product which has the ability to do this and more — Microbiome Support (MBS). An oral liquid pro and pre-biotic, it works wonders on the inside for calves and other animals. 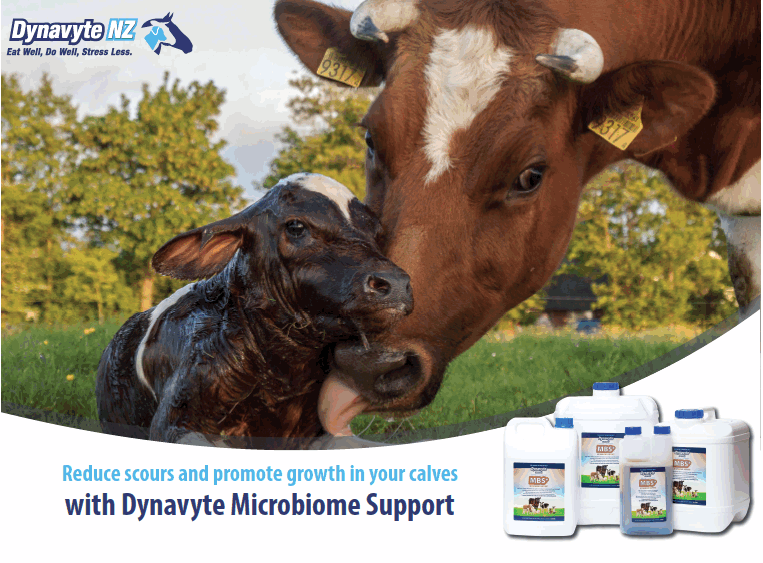 Excel Equine owners and South Island Dynavyte distributors Grant Beasley and Tracie Donelley said MBS was used to promote a healthy gut, which might promote rumen development and was a natural immune booster. Past users of the product had found it reduced mortality rates, and while it was a reasonably new product to the calf market, feedback from farmers already using the MBS had been that their calves were growing bigger and healthier, Tracie said. One example from a local farmer who raised calves was that despite having two neighbouring farms with rotavirus, their farm was using MBS and never got it, she said. In Southland and Otago, weather conditions could also cause problems at calving and some farmers had found using MBS on calves which were a bit down, or tired, had provided a much-needed pick-me-up for them. ‘‘It can pick up lambs and other newborn livestock that look like they aren’t going to make it,’’ Tracie said. MBS is soluble so is easy to mix in with milk. Using MBS will be beneficial in stabilising the micro flora in the gut which may lead to an improvement in the animal’s behaviour, making them more settled and easier to handle. It also may assist in improving food conversion which will lead to a reduction in feed costs, as well as supporting cows and calves with their nutritional requirements in times of stress and need. MBS is a gut health product formulated by fermenting humates and kelp. It is highly bio-available, being readily absorbed into the animal’s system. ‘‘Most of all it is very costeffective,’’ Tracie said. It can be used for all livestock, and some farmers had used it with pigs and goats and working dogs. ‘‘For dogs it speeds up digestion, maximises nutrition, improves coat condition and reduces inflammation,’’ she said. MBS is available in 1, 5, 10, 20 and 200-litre options. Tracie encouraged people to order now in time for calving, especially for larger orders. Dynavyte also has a range of equine products available including Equiette, which is an anti-anxiety supplement for horses, Tenderfoot, which is a natural herbal formula which may temporarily relieve minor aches, bruising and muscle tenderness, and Stop Greasy, which addresses issues associated with mud fever. Dynavyte products are available in store at Farmlands and PGG Wrightson as well.